A day out with a difference in Tameside! If you want a day out with a difference, or simply to relax with your family, or to celebrate something special, then hiring one of our self drive narrowboats would be the ideal solution. If you have thought about taking a holiday on a canal boat and are not sure if you would like it, then this is also the ideal way to find out. For businesses, our day boats are perfect for team development activities or a just a day out. Our 32 foot long Narrowboats “Mary” and “Alice” are available for hire throughout the year and will each accommodate up to 10 people. 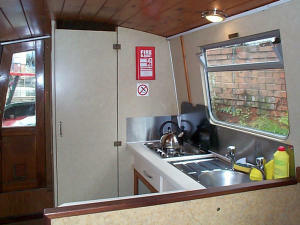 The boats are equipped with a two burner hob, sink, and crockery; they also have flushing toilets. The cabins are heated for cooler days, with seating and table available in the cabin as well as seating on the front and rear deck. You can spend a relaxing day exploring the Lower Peak Forest Canal, on the 8 mile lock-free stretch from Portland Basin to Marple, experiencing the canal’s unique mix of urban and rural environments which have many interesting architectural features including two short tunnels and the splendid Marple Aqueduct. You will receive full instructions on how to operate the boat so there is no need to worry if you haven’t any experience of steering a boat. It is possible to cruise all year round apart from days when there is thick ice on the canal or there are stoppages by British Waterways for essential repairs. 9:00 am to 8:30 pm – only available mid-May to 31st August. We are able to accept payment by credit card or debit card. Download a booking form to print, complete and return to us. You can read our Conditions of Hire here. 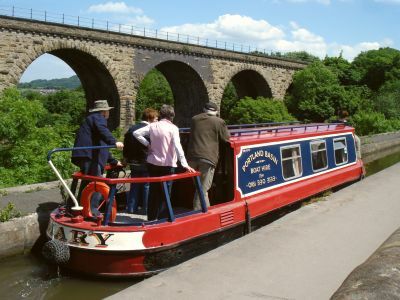 Before your day out on our boat it will be helpful for you to read the British Waterways Boaters’ Handbook online. Please contact us if you require further information or if you are unable to download and print the booking form. An ideal present for family and friends, you purchase the type of hire you want (standard, extended or evening) then the recipient just has to book the date they want for their special day out. Whether you want to bring along your own food or go for a meal in a pub or restaurant, there are several options for your day out. 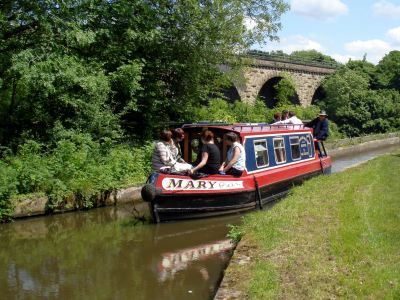 During a standard hire, you have time to cruise to Marple Aqueduct and moor up for approx 30 mins to 1 hour to enjoy your picnic, before returning to Portland Basin by 4:30 pm. During an extended hire, you have time to cruise at a more leisurely pace and moor for a longer period of time at Marple Aqueduct (or anywhere else en route) for your picnic. 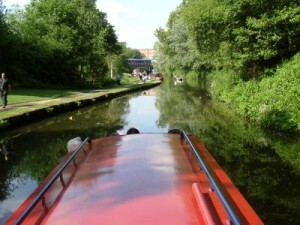 For an evening cruise you would probably reach the Woodley area of the canal, before starting on the return leg of your journey. During a standard hire, you have time to reach Romiley where there is a choice of pubs nearby bridge 14. During an extended hire, you can have a more leisurely lunch in either Romiley or Marple. 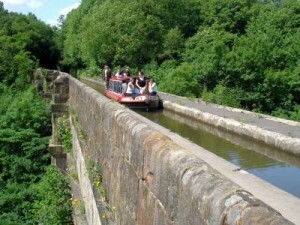 Marple has a variety of pubs and restaurants within a 10 minute walk from the bottom of Marple locks. What is the canal like? See the range of services and facilities offered at Portland Basin Marina. We offer day hire boats for a day out with a difference. 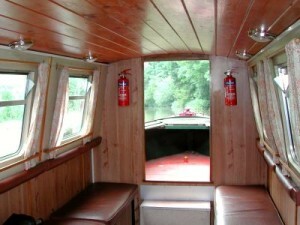 We also have a holiday hire boat for a longer getaway! We manage the mooring facilities at Droylsden Marina in addition to the moorings at Portland Basin Marina. Portland Basin Marina | Powered by Mantra & WordPress.